Fascination with mosaics is not a new thing. Mosaic is an art that has been around for a long time. A picture is created using small, colourful stones or glass pieces. That is how famous artworks in palaces and villas were created. Today’s view of mosaics is still very much effected by those ancient artworks. Over the centuries this art technique was preserved and was responsible for the visual design of important architectural structures. In the time of the Renaissance and Classicism they became more important. 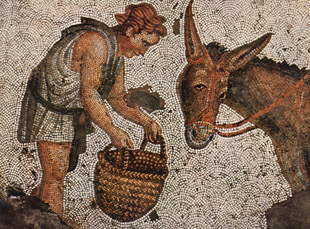 In those times the mosaic technique and handwork were in trend. Because of that mosaics can still be seen in the remnants of those times, in ruins and buildings from those eras. Mosaics are also related to the controversial painting style Pointillism. Pointillism reached its peak at the end of the 19th Century. Today it is present in the works of Paul Signac, Henri Edmond Delacroix or Georges Seurat. 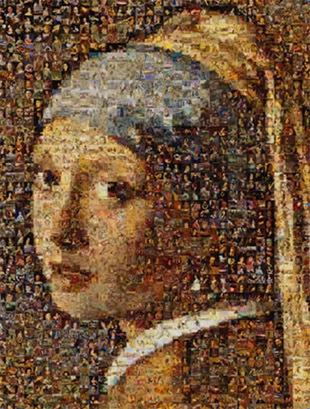 The modern photo mosaic is based on the same idea: a large image created from many small, colorful pieces. With one difference- the „mosaic stones“, the photos, each have their own image as well. This way there are two dimensions to the image. The main image, which gives the mosaic its overall effect, and the many individual images. A photo made of photos is created. The combination of modern computer technology and digital photo manipulation allowed the first creation of photo mosaics in the 90s. This development mostly took place in the USA. A few Americans claim to have invented photo mosaics. Robert Silvers played a very important roll in the development of photo mosaics. At 27 years of age in 1995 the MIT student developed an algorithm, which could organize many photo files into a complete image. This technology was patented in many different countries. Robert Silvers became a photo mosaic artist. His artworks include portraits of famous people like Marylin Monroe, but also artistic manipulations of classic paintings. He interpreted Vermeer’s „The Girl with the Peal Earring“ and Botticelli’s „The Birth of Venus“ in a new and artistc way. What kinds of photo mosaics are there? Today there are many different ways to create photo mosaics. But only are few are used. A complex ordering of the individual photos is usually seen as attractive. That way the effect that a perfect main image is created out of chaotic structures is stronger. The facination with photo mosaics is based on that contrast. 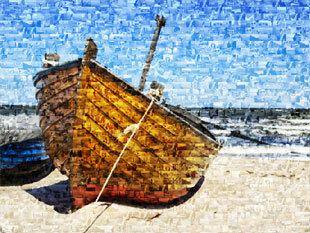 Mosaics made out of portrait and landscape format photos are getting more popular. They give the image complexity and a more authentic feel, since photographers often use a mix of portrait and landscape photos. If only landscape format photos are provided, the mosaic will be created out of lines of photos. The photos can be organized in different ways, however. How is the main mosaic image created? The individual images are given a color tone and are organized into the mosaic. That way each photo is used like an antique mosaic stone. A classic tile mosaic is created- but using photos. This method also works with only one photo. The individual photos can be sorted by the main color in them. The individual photo with the best fitting colors is placed on the appropriate spot on the main image. For this method many individual photos are needed for the optimal result. The result can also be better if the individual images are very small. 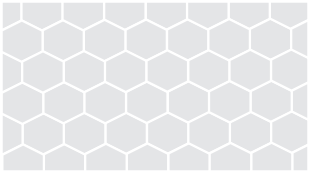 The individual images are partially colored in with the colors of the main image. This way you can get a great result with less than 100 photos, and the main image is easy to recognize. To increase the amount of photos, they can be mirrored, cropped, or stretched. Can you still recognize the individual photos? The large amount of individual photos is an important factor in the detail of the main image. The smaller the individual photos, the more detailed the main image can be. If the individual photos are very small, it is difficult to see them. Because of that they are usually limited to a size between 1 cm and 3 cm. The use of large individual images makes the main image chaotic. 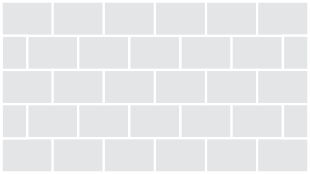 The images are recognizable- but they distract from the main image. That is especially true for individual images with strong lines in them. 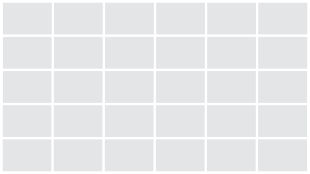 Small individual images make for a homogenous main image. However, it is difficult to see the details in the small images. 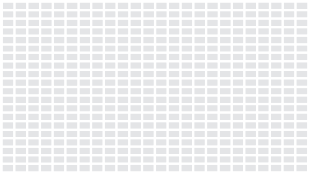 How many individual images does a mosaic need? 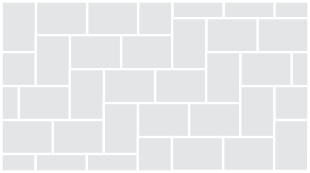 Depending on your settings, these factors can effect the finished look of your mosaic greatly. A balance is needed for a good result. Today mosaics are created to be hung on the wall. 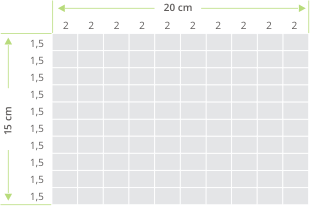 Because of that, the size is usually at least 90 cm x 60 cm. The larger the finished format, the more individual photos can be seen on the mosaic. With an individual photo size of 2 cm wide and 1.5 cm high, a 20 cm x 15 cm image is possible. However, typical wall mosaics are larger, about 90 cm x 60 cm. If you do not want the individual photos to be repeated, you need to upload the required amount of photos. However usually fewer are required, as the photos can be duplicated without being noticeable. Repetition of the individual photos gives the photo mosaic something special. It is also possible to create a memory game effect by searching for photo pairs. With large mosaics with thousands of photos there are many repetitions to be found. If there are only a few photos available for the photo mosaic, the amount can be increased by editing the photos. They can be mirrored or cropped. This makes the overall mosaic look more complex and increases the variation within the photo. Although the creation of photo mosaics has been popular for the last 20 years as a niche technique, it still has not lost its appeal. Photo mosaics make it possible to give a main image metaphorical meaning through the use of the right individual images. Celebratory events of every kind can be used to give a photo mosaic to someone special. The individual photos often tell the story of the life of the person receiving the mosaic, while the main image shows the person themselves. Photo mosaics are perfect for showing the many photos of your vacation or holiday. During a holiday many photos are taken, which can be organized together into one attractive image to remember it by. Children are great subjects for photos. That is why so many photos of children are taken. Photos of your children are perfect to create a portrait of your child. You can use the many individual photos to show memories, and the main image can be a large-format portrait. Just like in ancient times, photo mosaics allow for artistic interpretation and many possibilities for artistic expression. Just like back then, it is possible to create an overall feeling using small pieces which can have their own meaning. Businesses can also use photo mosaics for communication. For one, photo mosaics can be used to document company events or parties. They can also be used to show the employees of a company, with a logo as the main image. 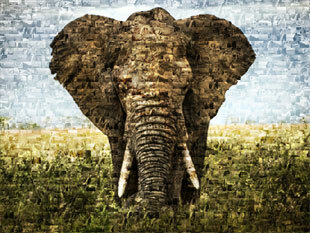 An elephant as a photo mosaic - on the edge between art and holiday memories.